Located in the center of Kentucky in the famed Bluegrass region, Harrodsburg in Mercer County was established in 1774 and ranks as Kentucky’s oldest town, as well as the first permanent English settlement west of the Allegheny Mountains. Harrodsburg was one of Smithsonian Magazines America’s Top 20 Best Small Towns for 2014! From Beaumont Inn, it’s a 10-minute walk through the historic district to reach downtown with its shops and restaurants. In the heart of downtown lies a National Register Historic District with a streetscape reminiscent of an earlier time. Although plagued by a number of fires that occurred during the 19th century, the restored Main Street is a national model. 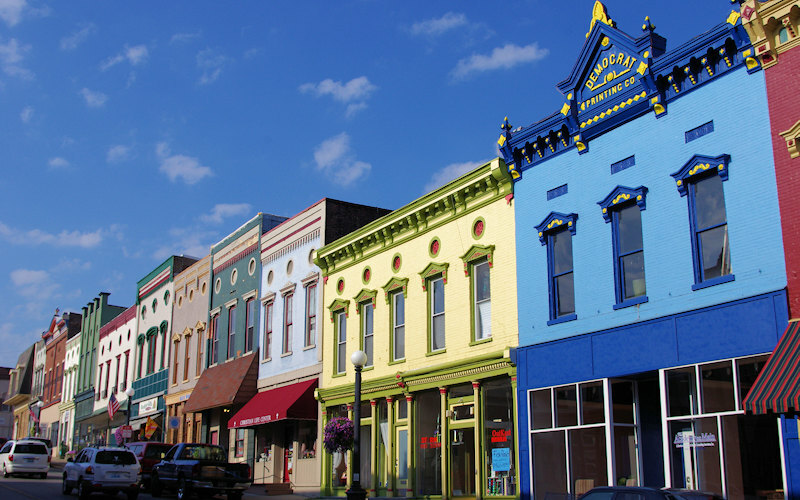 Buildings that date back to the 1880s and 1890s house restaurants, gift, antique and specialty shops. While downtown, stop to admire Olde Towne Park, which boasts a 14×32 foot cascading fountain. This unique creation of public art was inspired by the scenic palisades found along the Kentucky River on the eastern border of Mercer County. On your walk to downtown Harrodsburg from Beaumont Inn, you will pass by these beautiful homes. A self-guiding walking/driving tour highlights many of the architectural treasures that reflect the town’s heritage. Spanning more than two centuries, you’ll pass by stately pre-Civil War homes, churches and businesses — all prime examples of the various styles of architecture used in Kentucky. One site, Morgan Row, is believed to be the first and oldest rowhouse standing in the state. The structure houses the Harrodsburg Historical Society’s museum and research library. Ask for a map and guide at the inn office. While you are downtown, stop at the restored Dedman’s Drugstore (Chuck’s great grandfather), now home to Kentucky Fudge, for ice cream or a sandwich. The store on Main Street dates to 1860 and retains all of the original cherry cabinetry, the pharmacist’s station enclosed by cherry paneling and stained glass windows, and a soda fountain. Find beautiful local art and craft at the Arts Council of Mercer County Gallery downtown. And stop by the new Mercer County Public Library to see rotating art exhibits displayed in the foyer gallery, which highlights a 15-foot iron sculptural screen created to commemorate Mercer County’s agricultural traditions. Harrodsburg is also home to picturesque churches and the Ragged Edge Community Theatre – see what’s playing. Also, located seven miles east of downtown on U. S. 68, is the Shaker Village of Pleasant Hill. Founded in 1805, America’s largest restored Shaker community and National Historic Landmark is the only site of its kind where all visitor services are provided in original buildings. Today, 33 restored buildings are surrounded by 2700 acres of preserved farmlands. Shaker Village operates the 115-passenger riverboat Dixie Belle. The authentic sternwheeler leaves nearby Shaker Landing; the site where Shakers loaded flatboats with goods headed for Southern markets. Read more about Shaker Village. The town’s early history is showcased at Old Fort Harrod State Park, where a full-scale replica of the original fort stands. Here, you can experience “living history” as you learn about the hardships of fort life.As you stroll through the cabins, you’ll see many original artifacts that were actually used by the settlers in the late 1700s. Craftspeople in period costumes portray Kentucky’s early pioneers who lived within the stockade walls. Observe some of the daily tasks performed such as basketry, woodworking, weaving, tinsmithing, dollmaking, blacksmithing and broommaking. Children will especially be drawn to the cattle, sheep and turkey corralled in the center of the fort. Also on the grounds of the state park are the Lincoln Marriage Temple, the George Rogers Clark Memorial, a pioneer cemetery and the Mansion Museum. This Greek Revival home, built in 1930, displays an outstanding collection of paintings, Indian artifacts, Civil War relics, firearms and Lincoln memorabilia. The Mercer County Fair and Horse Show is billed as the oldest continuous fair and horse show in the nation (since 1828) and is considered one of the country’s top outdoor Saddlebred horse shows. See their busy year-round calendar of events on their website. Welcome to the Devine’s! Each September & October, enjoy getting lost and found in a corn maze! Use your intuition to work your way through the winding paths to get to the end. You will have loads of fun! Bring the kids along and let them experience the Kiddie corn maze, hay maze, straw crawl, petting area, pumpkin picking, and nightime bonfire with free marshmallow roasting! Read more on their website. Harrodsburg and Mercer County has a unique heritage.The rolling bluegrass fields are often fenced by dry mortar stone walls and many of the small hillocks are the sites of prehistoric Woodland Native American burials or settlements. Every architectural style is evident from the 15th and 16th century European post and beam with wattle and daub to the hewn log cabin; from the 18th century hand made brick home to the antebellum mansions with their slave quarters; from the ornate Victorian gingerbread sketchbook mansions and the Queen Anne revival houses to wonderful examples of the Arts and Crafts bungalow. It is the first permanent English Settlement west of the Appalachian Mountains and the birthplace of Western Expansion beyond the original colonies.